From Sunday 9 – Tuesday 11 April 2016, QEII hosted Football Medicine Strategies’ annual conference, bringing together experts in multiple disciplines from around the world. The event had 70 exhibitors and 1,700 attendees across the three days. 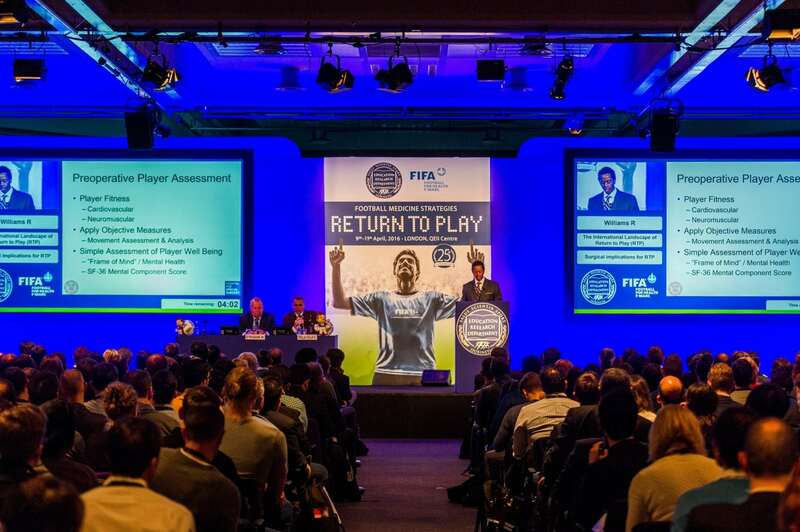 The objective for the event was to bring together physiotherapists and big names in the football medicine industry, with multiple panel sessions and exhibitions, while maintaining their formidable reputation as the leading body for sports medicine. Impressive AV was key to the brief as it is a global event and they wanted to make a visual impact and seamless organisation was vital. There needed to be access to content from high profile keynote speakers for all delegates no matter where they were in the building, even while networking or exploring the exhibition spaces. The event took over the whole centre, with big panel sessions in the Mountbatten, Fleming and Churchill rooms and exhibitions in the Britten, Whittle, Cambridge and Windsor rooms. Attendees received a warm welcome from our new concierge and our discreet security and airport-style check in desks meant the arrival of thousands of guests was hassle-free. Our in-house IPTV was used throughout the whole event to ensure access to content, with the main plenary in the Fleming streamed across the building and other content being streamed according to subject. We also set up an overspill room which could stream content from any over-subscribed areas. All rooms featured HD projection of live software demos on stage. On the main stage we used an analogue way next stage 8 switcher for its PIP facility, with a live camera feed on the big screen alongside the presentation and a custom background with built in countdown timer, running from a web-based system designed by our in-house digital services team. We made the most of our in-house equipment such as the qsys system to play music in all the exhibition spaces as it was important to the client that the whole event had the same sense of energy and dynamism that football has. In-house digital signage also had to be bespoke to programmed; the client relied on this quite heavily with over 50 individual different room screens programmed. QEII Live used multiple branding sources: print, digital canvases, visualisations, social media, IPTV and filesharing in order to convey the clients’ primary messages seamlessly. We produced cost-effective solutions to get the right messages across within the corporate environment. The effectiveness of the event managers and our in-house AV team meant the client didn’t have to worry about anything, everything was in-situ when they arrived for a walk-through which they were very happy with. 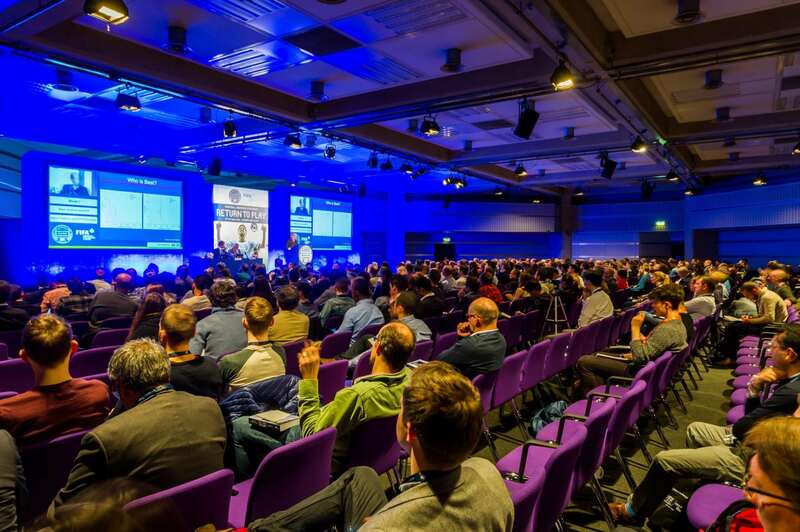 The event ran smoothly and excellent feedback was received from both clients and delegates, who used social media to talk about the event as it happened – the hashtag for the event, #RTP2016, was trending for 21 hours. We met with the client a few weeks after the event for a debrief and they commented that the event had ran even more seamlessly than in previous years, fulfilling all its objectives and keeping sponsors happy. As all the event content was recorded, it can now be used to ensure the longevity of the event. Football Medicine Strategies has worked with QEII for a number of years and have always been pleased with the level of service received. They have already booked their next event here in 2018 and have requested to work with the same event manager and AV project manager as they were so happy with the execution of the 2016 event.